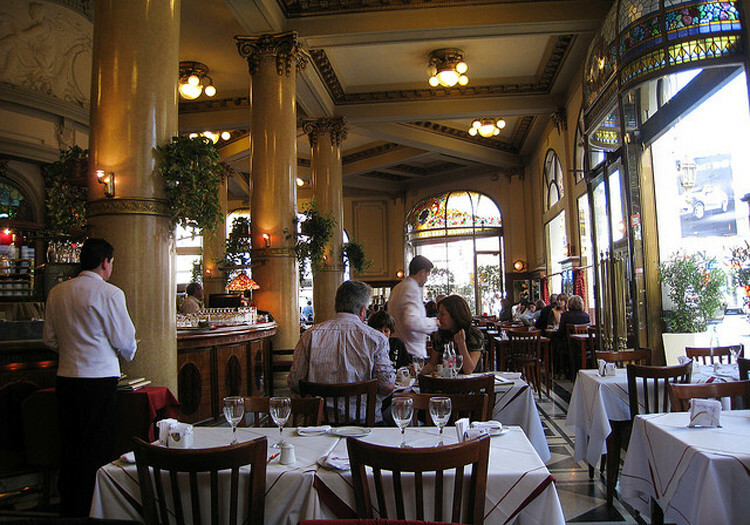 Traditional Buenos Aires cafés are part of the city’s heritage due to their history and architecture. 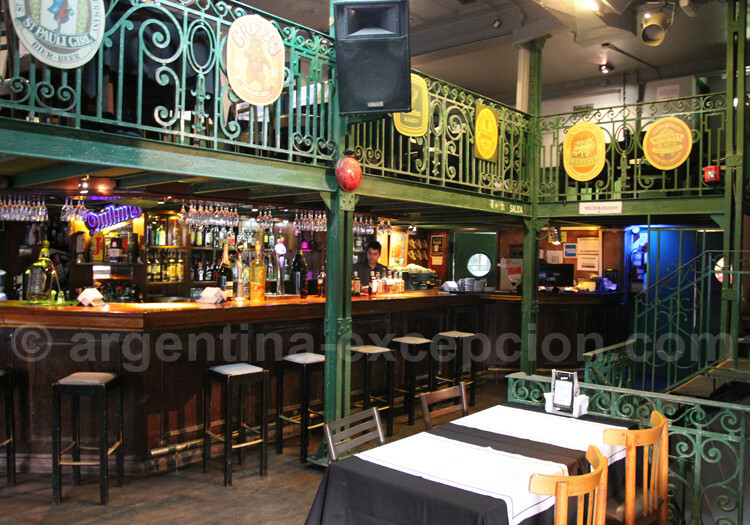 Argentina Excepción suggests a variety of “remarkable bars” and other modern bars. 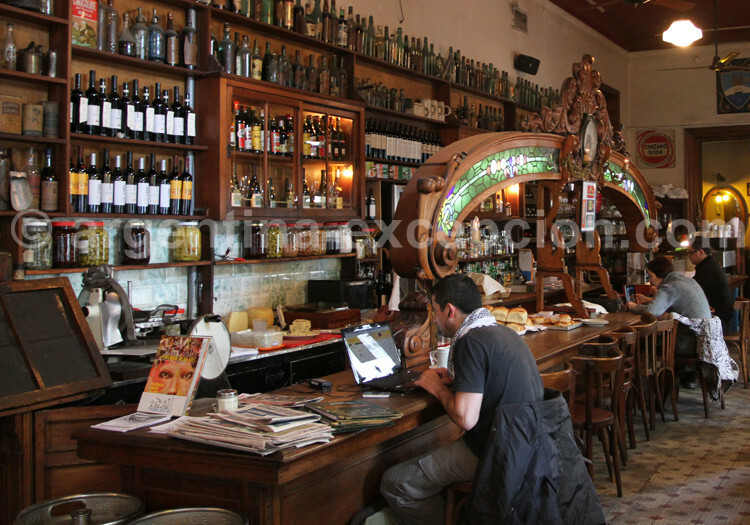 Opened in 1890, Rivadavia bar was the meeting point for poets and small hooligans of the area, who the police ironically called the “little angels”. The café was named “Little Angels” in the 1930s and was reopened recently after some years of refurbishment. It was worth waiting: the tearoom is wonderful. There is also a huge room for tango shows. 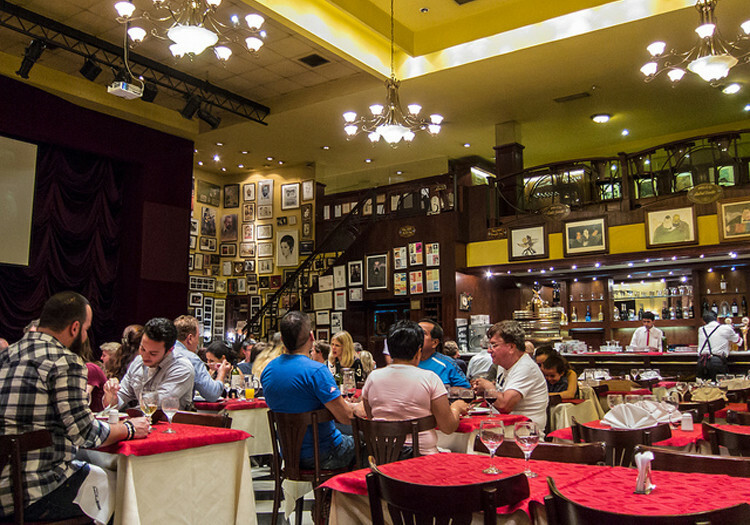 The corner of San Juan and Boedo is part of the tango history in Buenos Aires. 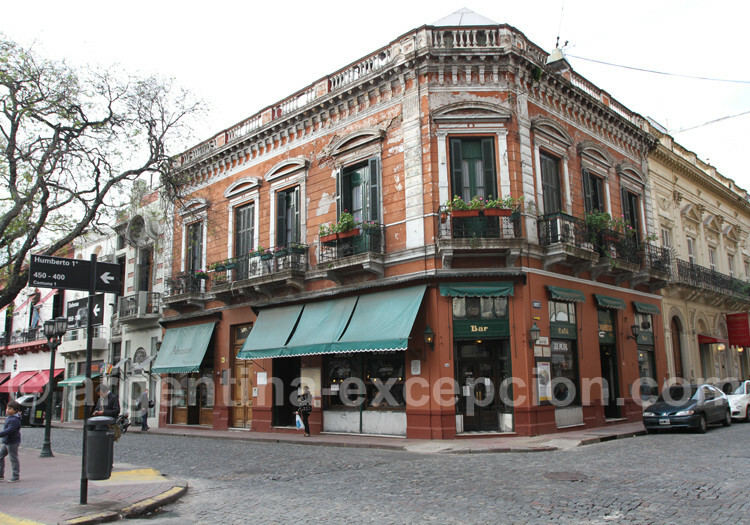 This bar was opened in 1927 and hosted a lot of celebrities, like the script-writer Homero Manzi, among others. Visitors can find photographs and memories that evoke him with a bit of nostalgia. 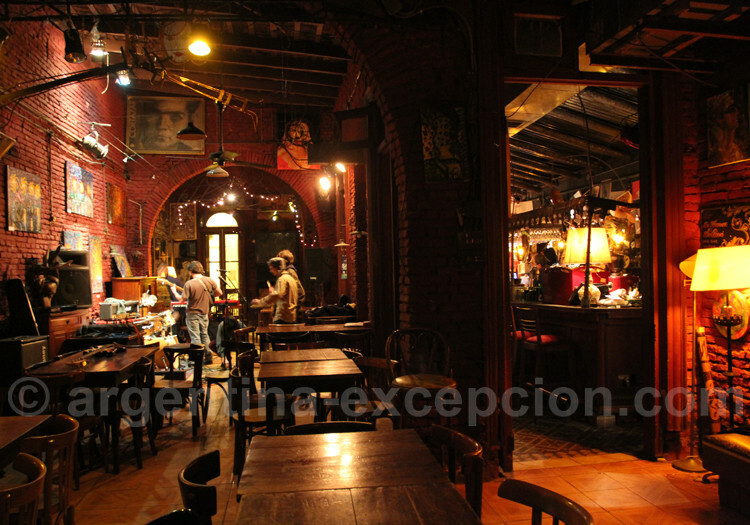 At night, the café is turned into a room for tango shows. Address: Avenida San Juan 3601, corner Boedo. 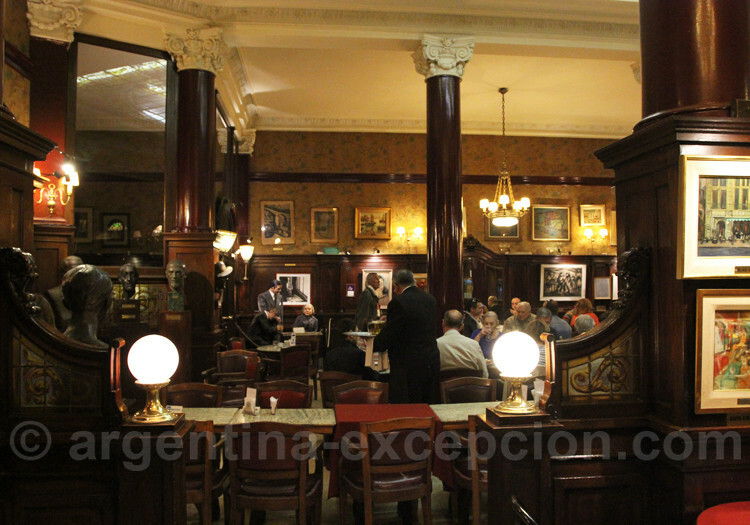 It is a mythical café in Buenos Aires opened in 1858 inspired in the famous café on the Italian boulevard in Paris. It was a meeting point for politicians, journalists, writers and poets. The rooms are big with marble tables under the Art Decó glassed ceilings, there is a room for tango shows and a small museum. Tortoni café is so well-known that sometimes you must queue outside to get a free table. Despite being an obvious tourist point, Tortoni is a must-see. Specialties: chocolate with crullers, milkshake (ice-cream). 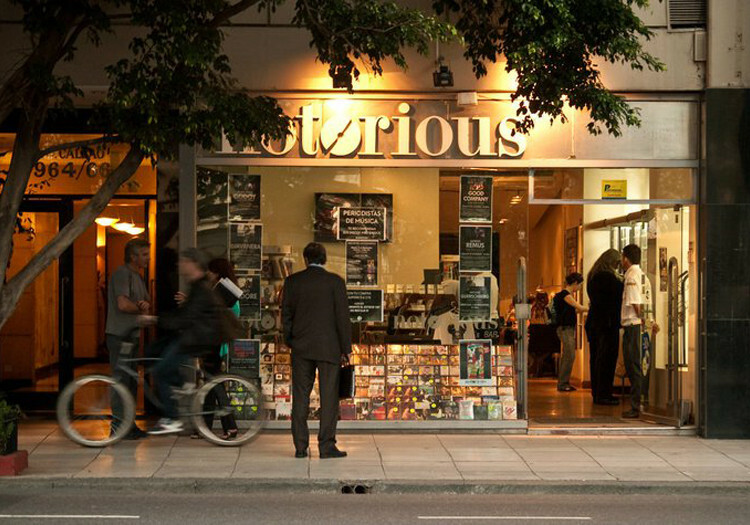 Address: Avenida de Mayo 825/829. Opened in 1912, Confitería Ideal entails an antique charm that will make you go on a trip along the history of Buenos Aires. 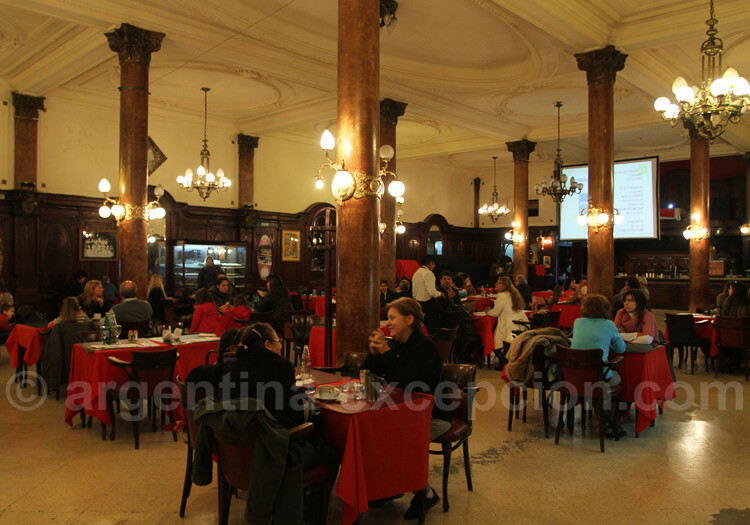 There are two huge rooms, one downstairs and one on the first floor with the same waiters as thirty years ago in a little depressing decoration with columns, woodwork, stained-glass windows, and mirrors. La Ideal offers tango every day: courses, milongas, concerts and shows. A European pub in a warm, friendly and funny environment. 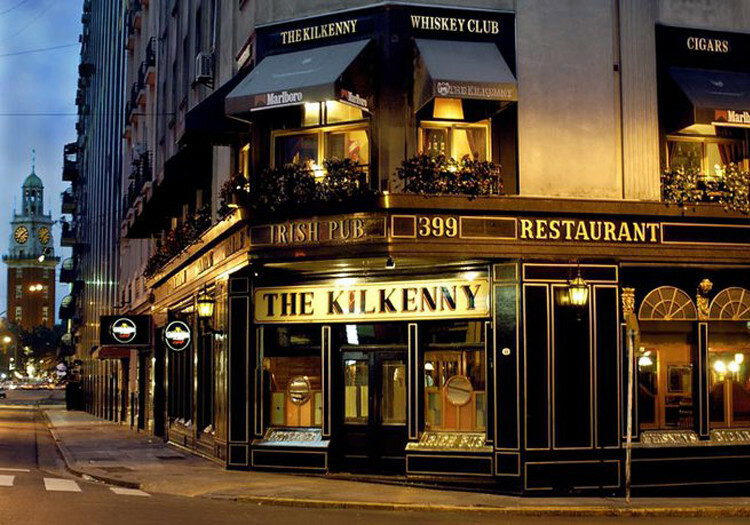 You can have lunch with the set menu and a great variety of beer, booth and whisky. Happy hour from 7pm to 9 pm. Live shows every night. It is open from Monday to Saturday. This library was opened in the 1930s and was turned in a library-restaurant-room for shows. You will find a warm and intimate environment, high-level cultural activities, and a variety of proposals: jazz, tango, tales, poetry, etc. 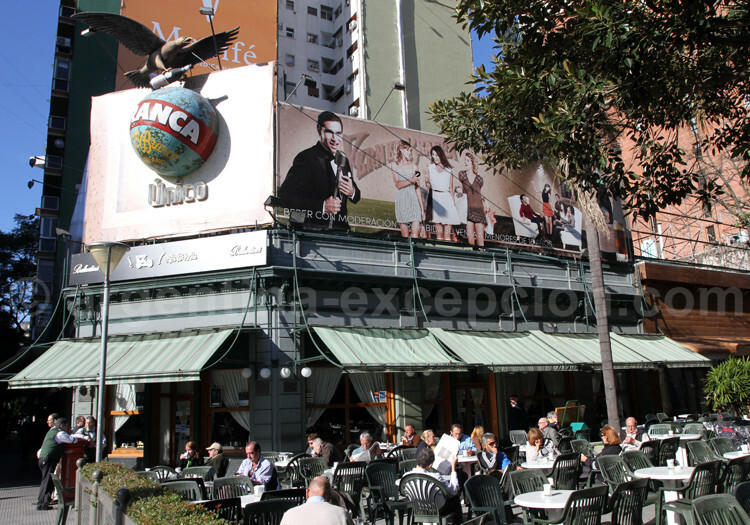 In front of Francia square and the Recoleta cemetery, in the 1940s and 1950s, La Biela was a meeting point for fans of car races, among whom you could find famous Fangio, and famous artists and politicians. There is a nice terrace in the shade of a gigantic rubber plant. 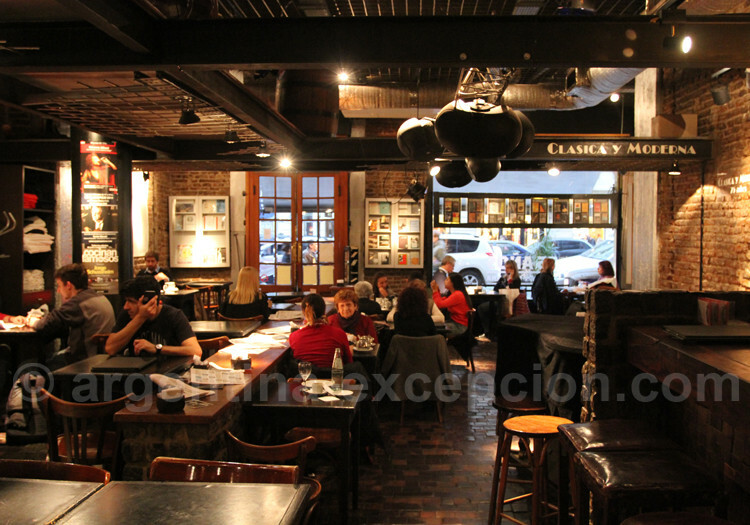 Bar and restaurant with the spirit of Dublin pubs and the first one in Latin America to have obtained the authorization to sell the famous Guinness stout beer. You will also find any alcoholic drink that you can think of, with a strong tendency to beer and whisky. Address: Marcelo T. de Alvear 399. 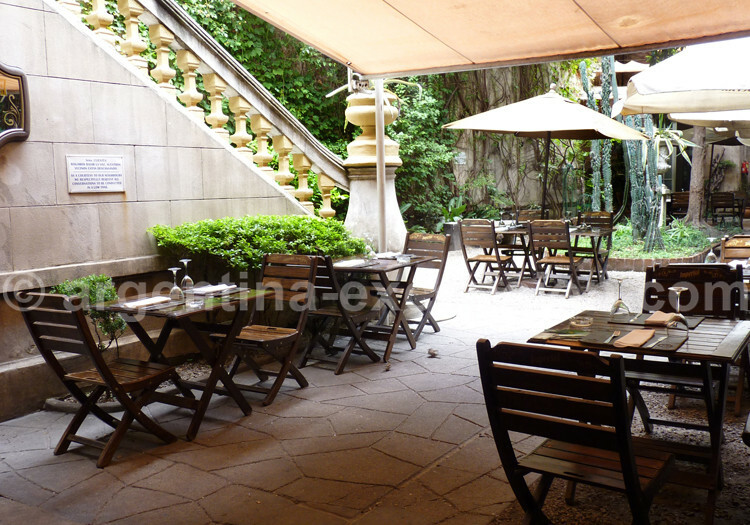 La Dama de Bollini was also visited by artists and is located in one of the most beautiful passages of Buenos Aires. Exhibitions and concerts. You can have dinner there, pasta is the house specialty. Happy hour from 6pm to 9pm every day, except Saturday. In a beautiful house dating back to the beginning of the 20th century, you will find a restaurant, a bar with a great variety of cocktails and snacks, a garden, a projection room, exhibitions, a great room, concerts… All tastes are suited at any time at Milion. A jazz bar that suggests concerts and tables equipped with headphones to choose your own musical program among 60,000 tracks. There is a room for the restaurant, a nice garden and modern decoration. A great bar dating back to the beginning of the century with a row of rooms where you may try their excellent Spanish omelet or read peacefully. 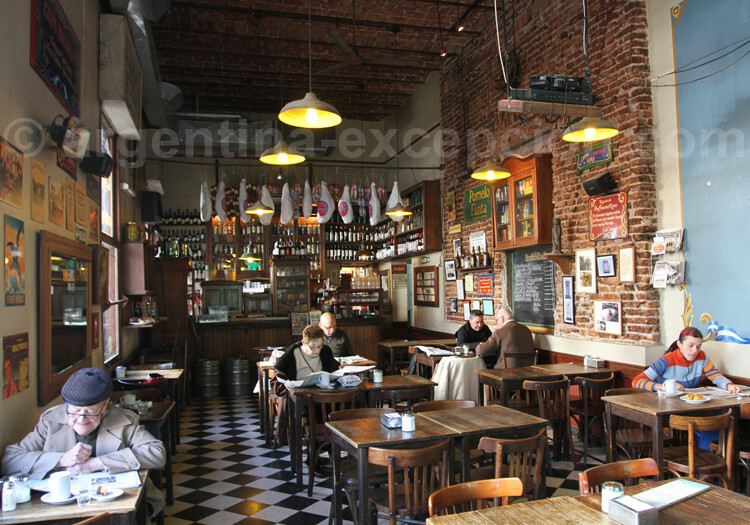 El Federal is one of those nice old cafés in San Telmo. Address: Carlos Calvo 395, corner Perú. 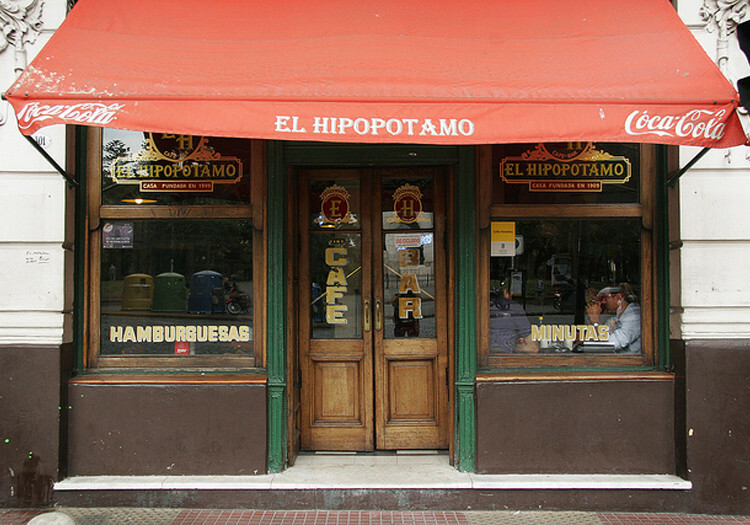 In front of Lezama park, El Hipopótamo was opened in 1904 and preserved its old wooden bar, the ham legs hanging from the ceiling… you can read the newspaper, watch passer-bys and take some time off. Exactly on the opposite side of the street, El Británico was opened in 1926 and was a meeting point for former British soldiers who stayed in a near guesthouse and who finally inspired the change of the name. Customers from the neighborhood and tourists can be seen in this old café open 24h. 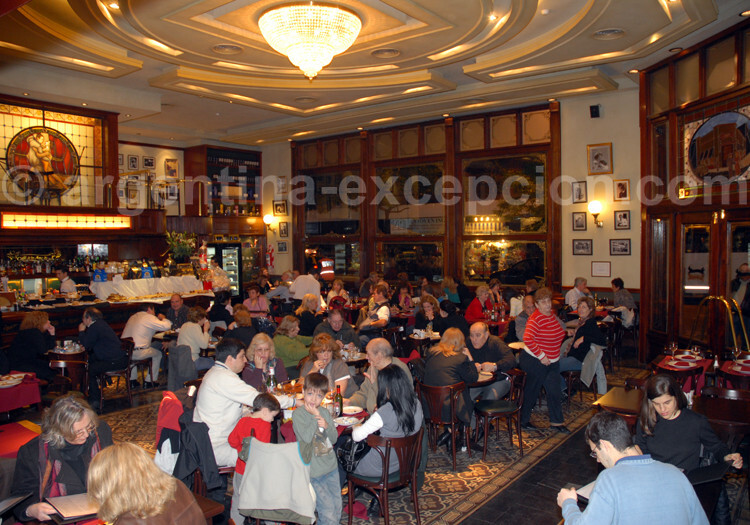 The yellow photographs and walls give the idea of the age (150 years old) of this venerable café at Dorrego square in the heart of San Telmo. It was witness of the visit of some celebrities such as Jorge Luis Borges and Ernesto Sabato, and nowadays of many tourists. It has a great terrace over the square. Address: Defensa 1096, in Plaza Dorrego.